In 1951-52, the young violinist Arthur Grumiaux made his first tour of the United States. Charles Munch had hired him to play as a soloist with the Boston Symphony Orchestra. While he was in Boston, Grumiaux made his first LP records for the small Boston label, run by BSO hornist James Stagliano. The two LPs of Grumiaux performances--along with a third on which he played in Brahms's Horn Trio--have become major rarities, and they have been unavailable for 40 years. 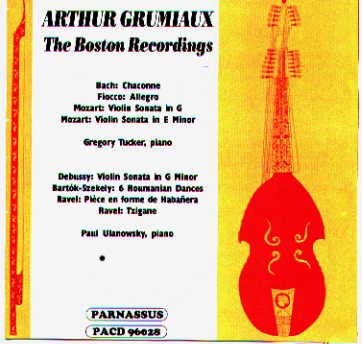 Parnassus has now reissued the complete contents of Grumiaux's two Boston LPs on a single disc, with the cooperation of Boston Records and its new owner. They reveal a dynamic young artist, even more outgoing and vital than on his superb later recordings, in collaboration with two outstanding pianists. Paul Ulanowsky, who plays in works by Debussy, Bartók, and Ravel, is well known from his many collaborations with such outstanding singers as Lotte Lehmann, George London, Ernst Haefliger and Aksel Schiøtz. Gregory Tucker, who plays in two Mozart Sonatas, was a noted composer and pianist who taught at Harvard and M.I.T. However, his Boston recordings with Grumiaux seem to be his only recordings. Boston's vital-sounding recordings have been expertly restored by Steven Smolian of Smolian Sound Studios. The CD includes Bach's Chaconne, Fiocco's Allegro, Mozart's Sonatas K. 301 & 304, Debussy's Violin Sonata, Bartók's Rumanian Folk Dances in the familiar Szekely arrangement, and Ravel's Pièce en forme de Habañera and Tzigane. Click disk image or here for complete disc contents.